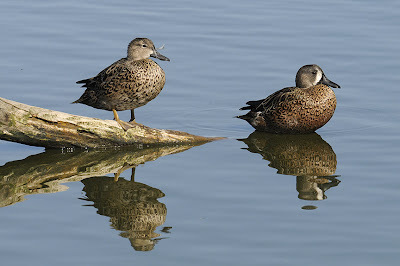 A few Bay-area hotspots were very conducive for duck photography, inlcuding the aptly-named Duck Pond at the Palo Alto Baylands Nature Area. 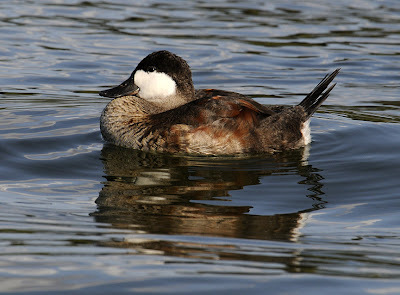 Though throngs of feral domestic ducks and geese roam threre, a small group of Ruddy Ducks were enjoying the pond as well. 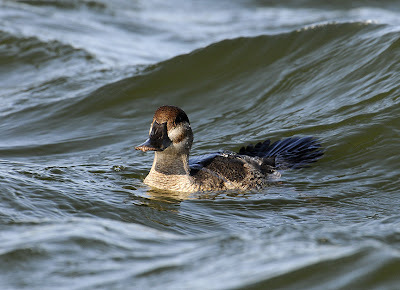 This female was riding out some decent waves in the strong winds, while the male relaxed in the lee of some vegetation on the other side of the pond. 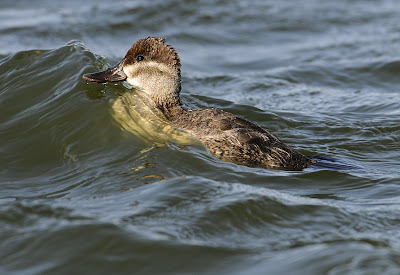 While I see Ruddy Ducks all the time here in Colorado, they are usually out in the middle of big lakes, so I welcomed the chance for such detailed photography. 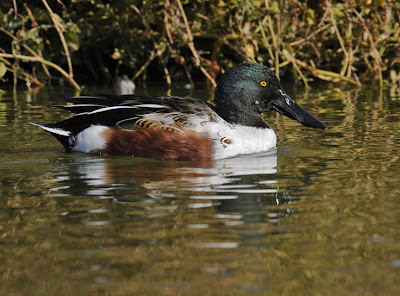 Another great locale for ducks and shorebirds was the Radio Road Ponds in Redwood City. 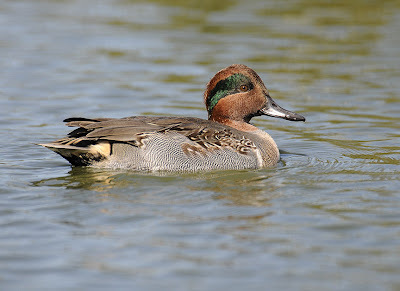 Located at a water treatment plant, the ponds gave great access to many ducks including all three North American teal species. 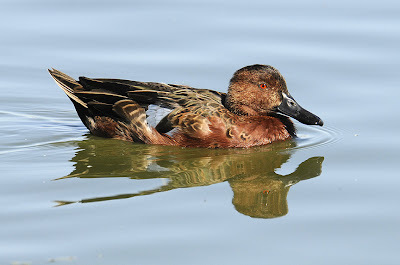 My favorite is Cinnamon Teal- a very sharp-looking duck that can be frustratingly hard to photograph well. 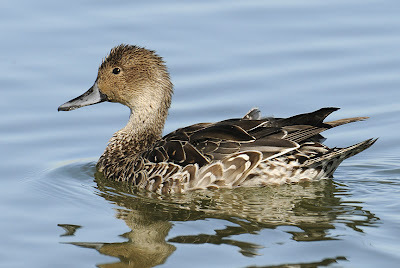 One female Cinnamon Teal had a funny tuft of feathers on the back of her head- a bit of a Palin 'do, perhaps. 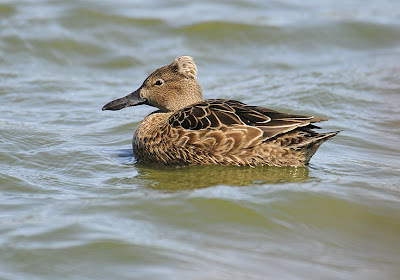 There are domesticated varieties of ducks with this tuft- one variety I found online is called a Crested Duck. 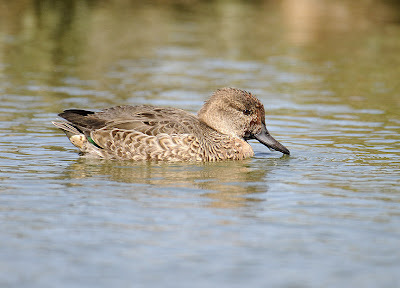 I wonder if the gene got back into this wild Cinnamon Teal, or if it is a natural expression of the gene that breeders exploited. 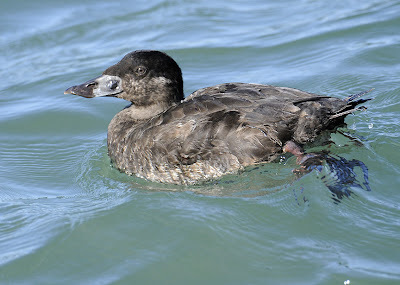 I'm guessing the latter, because other than that the duck looks normal to me without signs of domestication. 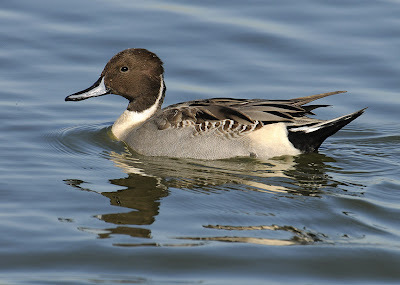 I'll wrap it up with a few other ducks from the Radio Road Ponds, a male Northern Shoveler (great eyes on that bird) and a couple of Northern Pintails. 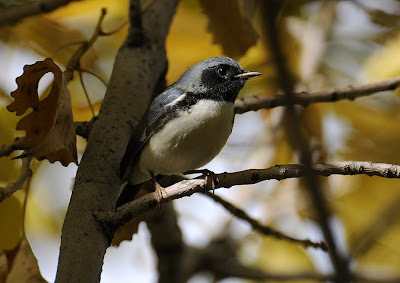 This weekend, while out gardening in my back yard, I had the unexpected delight of seeing a male Black-throated Blue Warbler. I initially heard call notes that didn't fit the usual backyard selection, and then saw the bird up in a tree above my circulating bird bath. It was really backlit and all I could make out at first were white underparts and what looked like black upperparts, kind of like a Slate-colored Junco. Then I noticed a white flag in the wing where no junco should have one, and the calls weren't right for a junco, so I knew I had a good warbler. I trotted inside for my camera and re-located the bird in another tree above the fence by honing in on its calls, getting a few shots before it continued into a neighbor's yard and beyond. This was a new photo lifer for me, which I thought was kind of cool since just last week I had just traveled a long way, spending bucks and vacation days to get 4 new photo lifers in California. I guess it goes to show that sometimes you go to see good birds, and sometimes good birds come to see you. 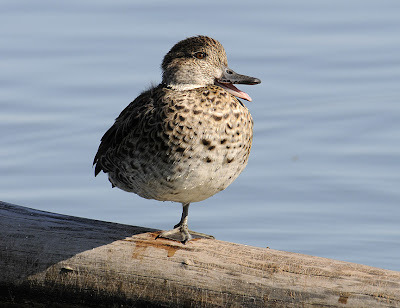 I finally have a few moments to report on my trip to California last week for the Western Field Ornithologists annual convention and associated birding in and around San Mateo. 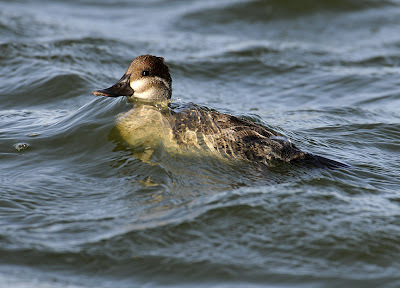 I arrived in the state on Wednesday, October 8, in anticipation of a Bodega Bay pelagic trip the next day. 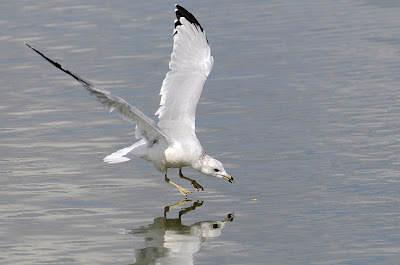 I had a few hours to spare before a friend flew in, and headed up to San Fransisco for a little sightseeing & birding. Disappointingly, while birding around the Golden Gate Bridge I got a call from Debbie Shearwater letting me know that the Bodega trip was canceled (something about 50-knot winds and 20-30 foot seas...) Well, I had been on a lucky streak up till then, not losing any pelagics to weather in 6 previous sorties, but it finally caught up with me. 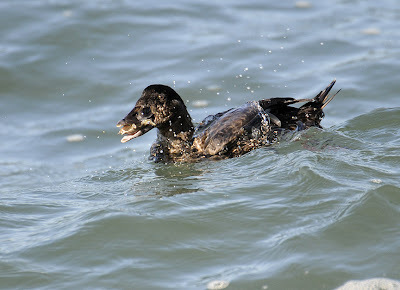 I consoled myself by snapping some neat shots of a Black Scoter that was feeding right off of the rip rap at the Presidio. Here it is masticating some sort of crustacean- anyone know more specifically what that thing is? 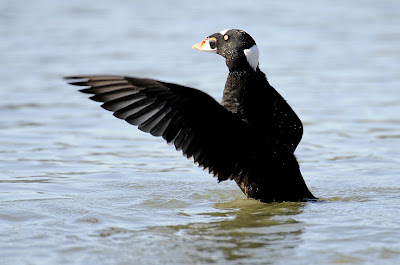 So on Thursday my buddy Nathan Pieplow and I headed inland to the Central Valley in search of a few target birds of mine. I was rewarded with two lifers, Yellow-billed Magpie and Nuttal's Woodpecker at Caswell State Park. I got pics of the magpie but only fleeting glimpses of the woodpecker, which was much easier heard than seen in the grapevine-draped oaks and cottonwoods found along the Stanislaus River. 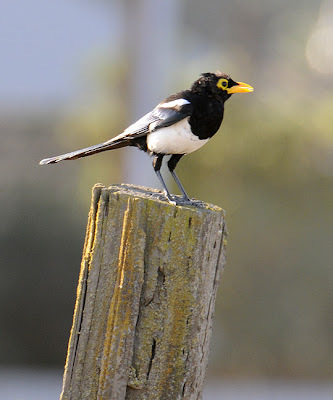 That's one cool magpie- I like the eye-ring as much if not more than the bill! Those ended up being the only two life birds I got on the trip, but I added three other life photo species in addition to the magpie. 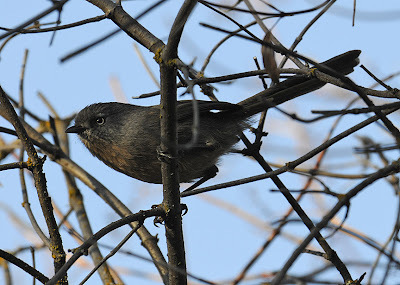 Wrentit, California Towhee, and Marbled Murrelet all are now also part of my photographic portfolio. As you probably surmise from the Murrellet, I did get out to sea on the second of my scheduled trips, heading into Monterey Bay from Santa Cruz on Sunday. More pics from that trip and other California highlights will be forthcoming. 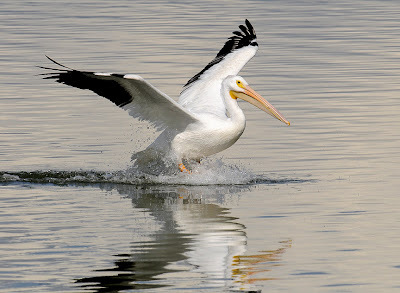 Anyway, to get some pelagic warm-ups, I headed over to nearby Union Reservoir armed with a big nasty bag of butter-flavored popcorn. I got the sun and the breeze at my back, tossed out handfuls of the floating yellow chum, and waited for action (nibbling a bit myself in an attempt to become one with the gulls.) 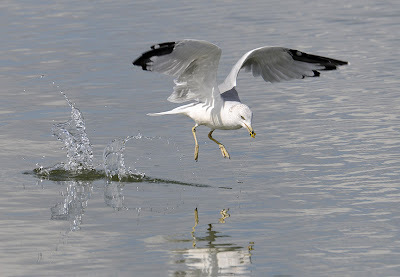 It took a while before any birds noticed, but once one started orbiting and diving for the soggy treats it was soon joined by throngs of Ring-billed Gulls. 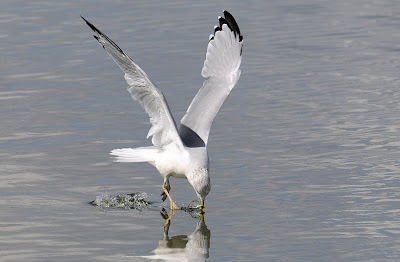 I was hoping that another gull species might sneak in, even if just a California Gull, but all I got were three age classes of Ringers. 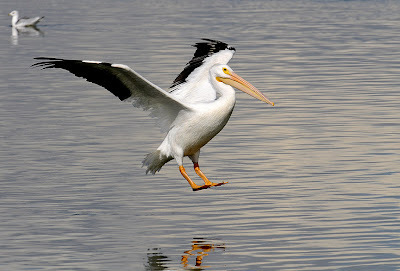 My biggest fantasy was that a jaeger would materialize to strafe the gulls, but the only birds besides the gulls that seemed curious were a few American White Pelicans that flew over to see if the gulls were on a school of fish. 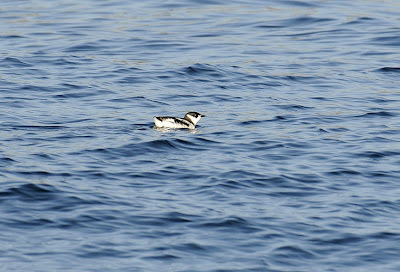 So now I'm primed for some pelagic flight shooting right? Yeah, sure. 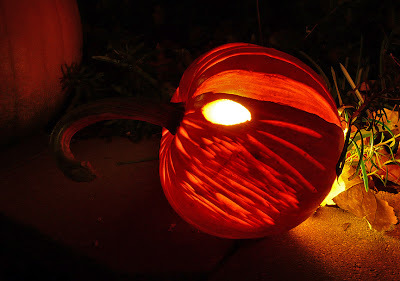 Kind of like a major-leage batter who takes a few easy swings with the weight on the bat before facing some real heat. 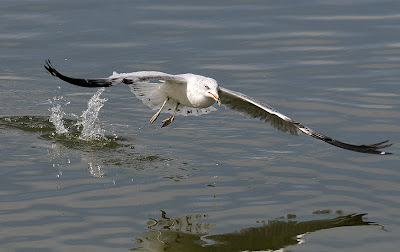 Wheeling gulls diving for chum might be a wee bit tricky, but on Thursday I'll also have the added joy of a heaving deck, birds shearing the wind over waves, salt spray, potential fog &/or rain, and the strong possibility of not feeling completely myself. I couldn't be more psyched. I've had a couple of thick envelopes arrive recently with review copies of two new bird books within. Both are well-timed for the upcoming holiday gift season, and worth consideration for that bird-loving person in your life. 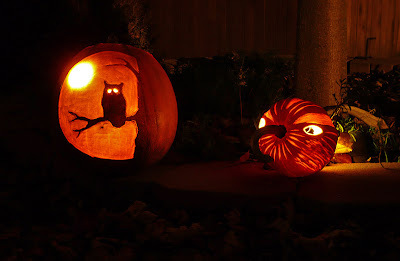 The first, The Owl & The Woodpecker, pretty much blew me away with the jaw-dropping, envy-inducing quality of the photos. The cover shot of a Northern Hawk Owl perched on a hoarfrost-flocked branch, gazing intently into the camera, is a fine indication of things to come in the book (the title is printed on a slip of translucent paper that you can take off to enjoy the full effect of the frame.) 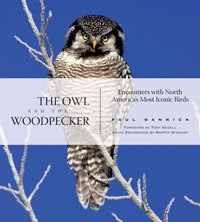 Author & photographer Paul Bannick chose owls and woodpeckers to be his tour guides through 11 habitats around North America, following the theme (& sub-title) of Encounters with North America's most Iconic Birds. I'll be the first to agree to the iconic nature of owls, but I wondered how woodpeckers could hold their own against one of my favorite groups of birds. Bannick's photography erased any doubt in this area, coming through with stunners of every North American woodpecker species. 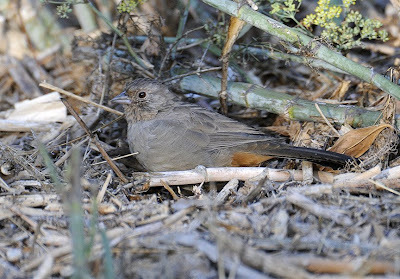 The pics go beyond just perched-at-the-nest-hole (although these are done perfectly) to many interesting behaviors, particularly feeding activities and some flight shots. For example, I love the shot of the Ladder-backed Woodpecker clinging upside-down on an ocatillo flower stalk, enjoying the nectar. A shot of a Yellow-bellied Sapsucker looking over its shoulder at a flying hornet amazes me. The expectant look on a pair of nearly-fledged Northern Flickers gazing out of their nest cavity towards the world that awaits them is awesome. These are among the many woodpecker images that are about as good it gets with bird photography- razor-sharp & with great detail, great composition, and telling a great story. Still, for me the owl photography is the most outstanding part of this book. Interestingly, most of the photos of this largely nocturnal group are taken in daylight, with lots of great habitat complimenting the composition of the shots. 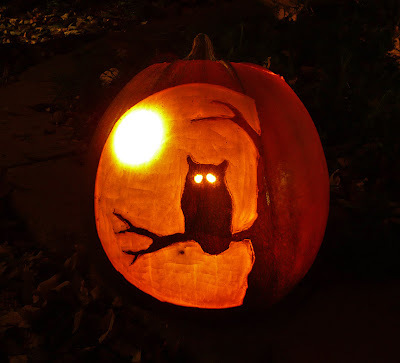 Many feature owls with prey, from a Flammulated Owl triumphant over a moth to a Snowy Owl passing a lemming to its mate on the nest. Plenty of flight shots add a major WOW factor, but surprisingly, shots like a fledgling Northern Hawk Owl running across a downed log are equally inspiring. Perhaps my favorite, though, is a Short-eared Owl caught in a Tai Chi moment stretching its left wing and left foot into wintry space while perched on a gnarly snow-padded mossy snag that alone would make a landscape photographer's day. The bird becomes an extension of the log in a way that's almost too perfect, something even a painter with total control over the composition would have trouble matching. Joining other recent bird book releases (The Smithsonian Field Guide to the Birds of North America & Bird: The Definitive Visual Guide), this book also includes a CD with recordings by Martyn Stewart of all 43 owl & woodpecker species featured in the book. I look forward to adding these to the growing list of bird recordings on my iPod. The other new arrival, Birds in Flight: The Art and Science of How Birds Fly, also has a generous compliment of impressive photos. 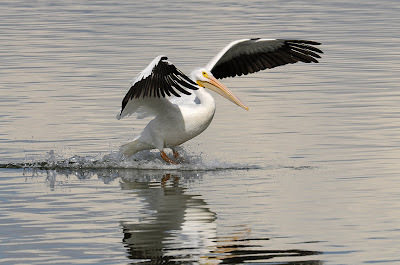 Author/photographer Carrol L. Henderson drew from a portfolio ranging from hummingbirds to albatrosses and about any flying bird you could imagine between these extremes to illustrate his topics. 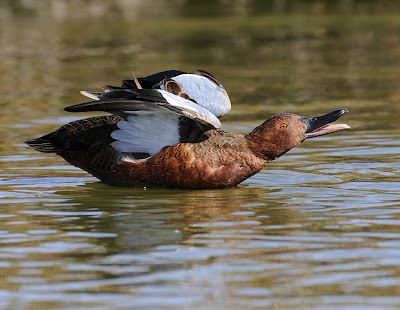 After setting the plate with a gallery of birds in flight in Part I, chapter 1, Henderson proceeds to Avian Aerodynamics in Part II and On the Wing, examining taking flight, flying, and landing, in Part III. The photography throughout is pleasingly varied, with a mixture of closeups, wide shots with scenery surrounding the flying bird(s), artfully blurred images conveying motion, and flock shots. A few photos, though, weren't up to the standard of others in the book (at least in the eye of this beholder.) Some appeared to be over-sharpened with artificial-looking edges, and occasionally a pic shows up that is really grainy, pixelated, or has very odd color reproduction. Call me picky, but I also didn't like the few shots of birds with jesses- seems like there are plenty of free-flying birds to choose from. Anyway, I would view the photography in this book more as supporting the text than standing alone as the best examples of flight photography. The text and accompanying illustrations are very informative, laying out all of the components of avian flight. Henderson details Aerodynamic Principals, Feathers and Bones, Wings, and The Tale of the Tail as chapters in Part II of the book. If you've ever been confused by terms like Wing Loading and Aspect Ratio, reading this book will set you straight and give you prime material for discussing birds in flight with your buddies or with the next field trip group you lead or join.